This new edition of the Pocket Oxford Thesaurus features over 230,000 synonyms and antonyms, to help you with all your everyday writing needs. This edition has been fully updated and contains new usage notes to help you avoid pitfalls when writing, and extra noun lists in the cen... read full description below. 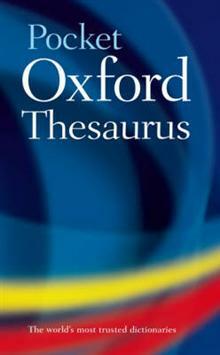 A handy hardback volume for home, school, or work, the Pocket Oxford Thesaurus features synonyms and antonyms for everyday words, as well as language help. Updated with all the latest must-know vocabulary, and with a completely revised text, this second edition is an invaluable tool for anyone who writes for work, school, or pleasure, or anyone looking for the word on the tip of their tongue. The centre section of this thesaurus has been revised and now contains even more lists of nouns, such as insects, fruits, or drinks. This information can help you to broaden your knowledge, or to find the answer you are looking for in a quiz or a puzzle. The A-Z text of the thesaurus features usage notes to help you identify frequently confused words, such as affect and effect, or compliment and complement, so that you can avoid common pitfalls when you are writing. This thesaurus also contains Word Link features, helping you to find words that are closely associated with each other. For example, the Word Link at the entrylaw informs you that the words legal, judicial, and juridicial all relate to laws, and the Word Link at darkness reveals that the fear of darkness is called scotophobia.Packed with extra tips and help, and with a completely revised and up-to-date text, the Pocket Oxford Thesaurus is an ideal reference book for anyone who wants to improve their writing.